The reaccreditation process can be alternately taxing and rewarding for CE managers. You will need to present a thorough accounting of your CME program’s achievements, unmet goals, and use of educational resources since its initial accreditation. You will also have to show how well your association has kept to its CME vision in light of any challenges it has faced. Although the reaccreditation application process is a challenging one, understanding the vital role of time and resource management can give you a competitive advantage. 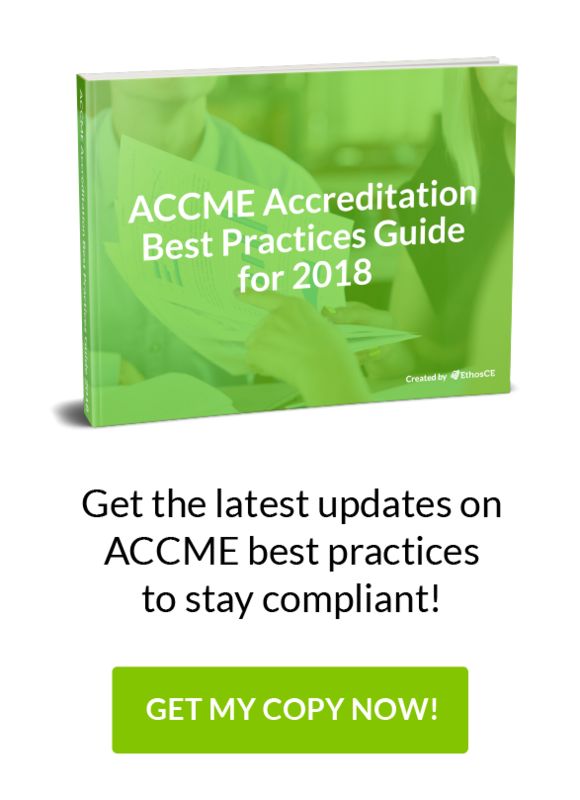 In this post, we will illustrate how to master critical tasks in the reaccreditation process and allocate resources to support ACCME compliance. Your reaccreditation application will require you to show evidence of your program’s ability to sustain a positive educational impact over time. Unlike your initial application for accreditation, you will need to present multiple examples of how your program has met the challenges of maintaining full ACCME compliance over a significant period of time. As you learned from your initial accreditation application, the Self-Study Report is your opportunity to showcase your ability to meet ACCME standards and your commitment to maintaining educational excellence in all of your programming. Let’s take a look at the areas that the Self-Study Report will cover and the criterion that will determine the success of your reaccreditation application. One of your most important tasks will be providing an accurate portrait of your CME model to ACCME. You will have to submit narrative descriptions along with detailed examples of how your CME program’s operations maintain compliance with ACCME standards. ACCME will look for proof that your program’s instructional design and LMS are user-friendly, representing the best employment of your resources to address your learners’ professional competency gaps. Every CE’s goal is to decrease the professional competency gaps of their program’s participants, and ACCME will want to know that you are meeting your goal. Below is a partial listing of the questions you will answer in the Self-Study Report. What are the professional practice gaps your activities are designed to address? What are the educational needs you have determined to be the cause of these professional practice gaps? Can you describe what your CME activity was designed to change in terms of competence, performance or patient outcomes. Why is your chosen educational format appropriate for this activity? What desirable physician attribute(s) will this activity address? When you are answering these questions, you’ll need to bear in mind that ACCME will rely heavily on the data you supply in your Self-Study Report during your reaccreditation interview. Your narratives should only reference successes that can be verified by recent data. The ACCME Performance-in-Practice Report will assess not only the current alignment of your CME activities with ACCME standards but also your capability to remain in compliance during the administration of any activities you plan to offer in the future. ACCME will select up to 15 activities for a comprehensive review. You will have to submit all relevant data supporting the claim that your program has adequately addressed the professional knowledge gaps of your learners. You will also need to give evidence that your program remains free of any noncompliant commercial relationships and that the financial relationships of any member of staff, instructors, or curriculum providers are aligned with ACCME regulations. As you prepare for the evidence gathering phase of creating the Self-Study Report, you will need to make an honest assessment of your medical association’s CME resources. These include your LMS, your human resources, and your CME data management system. If any of these key components are a point of weakness in your program, then you will meet a formidable challenge in presenting a positive portrait of your future potential for success. The following are a few questions to ask when determining the resources that you will need to enhance or acquire to show your ability to meet ACCME’s high standards as your program develops over time. Is our LMS platform easy to navigate for our learners? Are the activities enrollment and payment process simple and tolerant of user error? Are we fielding tech support issues which could be solved by finding an LMS service with an integrated help desk? Is our process for managing PARS submissions time-consuming and difficult to manage? Do we have a method of collecting activities data that works seamlessly with our LMS? Do we maintain a knowledge base of ACCME guidelines that will allow us to monitor programming compliance? Do we have the resources to update our instructional design model if it becomes clear that the needs of our learners have changed? It may be that several of these questions can’t be answered affirmatively—or they might not be known. A platform such as EthosCE can make managing your CME program while preparing for the reaccreditation process a far less stressful experience. EthosCE offers data management and PARS submissions for you so that you can focus on preparing for the ACCME review process. As a CE coordinator using the reaccreditation process, you will need to be certain that your LMS has been designed to provide the best user-experience for your learners. You will also need to have a tech support service available for your members so that you can avoid devoting precious time to answering support tickets. The instructional design of your CME programming is the most important element of your ACCME compliance effort (followed by website usability). Your chosen CME management service should have the resources to provide expert consultation on activity design, as well as the ability to handle production if needed. At EthosCE, we’ve helped medical associations of every size achieve reaccreditation. Connect with us to find out how we can guide you towards reaccreditation success.